Home to Hawaii’s biggest city, an abundance of lush, tropical greenery and an exciting array of diverse art and culture, Hilo has a lot to offer its visitors. Whether you prefer to hike into the forest and enjoy the island’s natural beauty, lounge on the stunning beaches, or explore the food, art and culture you can find around every corner, Hilo is bound to be one of your favourite places to visit. We’ve put together this guide to the best things to do on the island, so you don’t miss a thing. Hawaii’s islands have some of the highest levels of rainfall in the world, and Hilo is no different. With a warm tropical climate, an abundance of lush greenery and 130 inches of rainfall a year, Hilo has a number of stunning waterfalls. 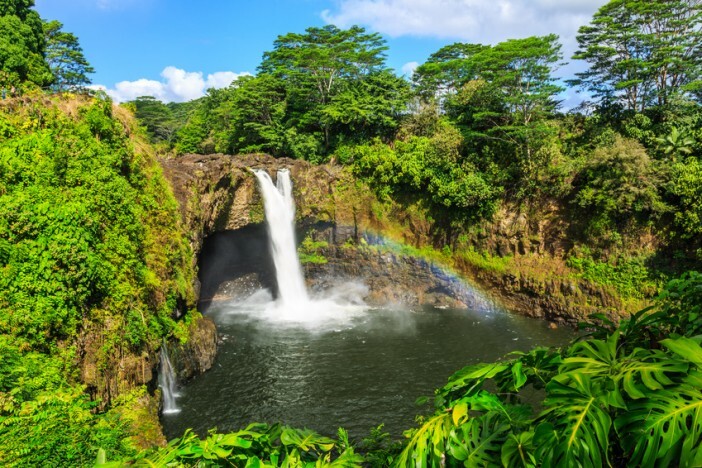 One of the best is Rainbow Falls at Wailuku State Park, just a little way out of the city. The powerful waterfall cascades over a legendary cave that is said to be home to Hina, the mother of demi-god Maui. In the morning, the sun on the rising mist creates stunning rainbows all around the falls. Hilo farmers’ market is an institution and its stalls are always bustling with visitors and locals alike. More than 200 vendors sell locally-grown fruit and veg, homemade food, island crafts, beautiful flowers (including the island’s famous orchids) and numerous other things. You can try all kinds of delicious foods you never even knew existed here, as well as finding some exciting souvenirs. Sample all kinds of seasonal fruits from fresh papaya to sweet white pineapple, then grab a Puna coffee whilst you watch the locals and tourists barter with stall vendors. If you are craving a beach day, Richardson Ocean Park is the place to head to. The beach is made of black volcanic sand, so it’s a bit of a different experience to your usual paradise island. Grab yourself a coconut tree for shade and make sure you bring your snorkel – sea turtles swim right up to the shore and there are reefs all around the beaches. If sitting still isn’t for you, you can follow the trails through the gardens and cool off with a swim afterwards. The facilities are really good as well, with showers and restrooms on site. Pop into the little ocean education centre to learn a bit more about the marine life that lives around the island. Downtown Hilo has a really local feel, packed full of charm. The Old Town has been really well renovated, and ramshackle building jostle with amazing eateries for your attention. Wander around the picturesque streets and discover cute shops and cafés to peruse. Whilst you’re there, the historic Palace Theatre shares Hawaiian history and culture through performing arts and is well worth a visit. Whilst you’re downtown, enjoy a visit to the Imiloa Astronomy Centre, which has stunning shows you don’t want to miss in its planetarium. The exhibits explain the importance of the stars to early Polynesian voyagers, and how they contributed to the discovery of the Hawaiian Islands. It celebrates Hawaiian culture and Mauna Kea astronomy, showing how science and culture can be united to advance knowledge. The centre makes for an enjoyable rainy day visit, and the restaurant provides sumptuous feasts. If you want to learn more about the culture, history and art of the island, the East Hawaii Cultural Centre is a great place to get a good overview. Providing an inclusive platform, the centre encourages the expression of the rich and complex cultural diversity in the area. Using exhibitions, workshops and performances in the community theatre space, the cultural centre has created a space for exploring the diverse creative influences that make up the culture of East Hawaii. Suisan Fish Market is one of the last open-air fish auctions in Hawaii, selling beautiful fresh fish to local grocers early in the morning. Next to the market is, unsurprisingly, one of the best restaurants to eat fish in the whole of Hilo. It is a favourite among the locals for its amazing sushi and other Japanese dishes, with the chef’s macadamia nut roll and the browned butterfish misoyaki repeatedly named as standout dishes. The restaurant itself overlooks Queen Liliuokalani Gardens and Hilo Bay, so there are beautiful views to enjoy if you can tear yourself away from the amazing food. Ken’s House of Pancakes is a Hilo institution, serving breakfast 24/7, as well as burgers, sandwiches and fried chicken. Drop in for a late breakfast, or after an evening out, and enjoy some of the locals’ favourites such as French toast, short stacks covered in maple syrup, hearty omelettes and fluffy waffles. It might not seem like traditional Hawaiian fare, but nothing says Hilo like a slap-up meal at Ken’s Pancake House. Wash it all down with the full pot of coffee that sits steaming at every table. If this guide has made you desperate to visit Hawaii’s biggest city, why not book one of Cruise1st UK’s amazing deals on cruises that stop here? Browse the full range online, or call our friendly sales team on 0808 274 6777. 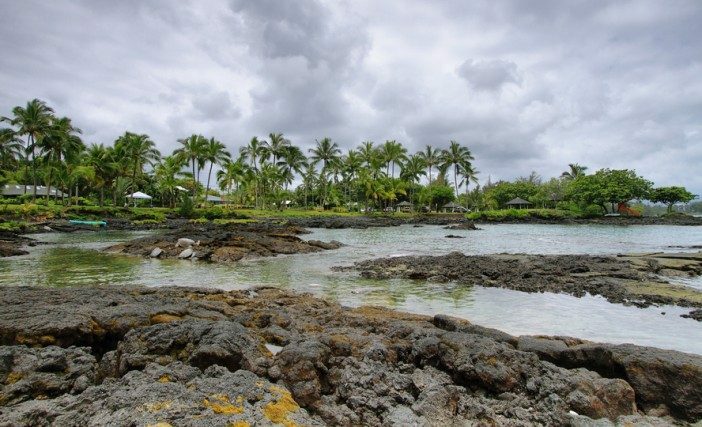 Whether you want to go hiking in lush greenery or learn more about Hawaii's cultural heritage, Hilo is a great place to visit on your island holiday.